We are all fine here, just very busy as usual, what with the boys’ activities, work, etc. Back in April, I broke a bone in my right foot. Wish I could say it was from something like kickboxing, but I literally twisted my foot falling off my shoes. Naturally that put a severe crimp in all of my activities. No riding, or anything that could potentially cause delayed healing. It’s clinically healed, but you can still see the break on x-ray. It may take up to an additional 3 months before showing as healed on x-ray. The good news though is that I am now cleared to ride, just can’t do anything with any impact (running, jumping on the foot). Noah and Josh are now in 3rd and 2nd grade. They were very busy with sports through the summer. Recently Noah expressed interest in going to the barn and helping with Kwinn. Mostly he wants to groom and bathe him. Kwinn doesn’t mind, although he gets a little antsy as Noah will sometimes just go over the same spot continuously. I’ve tried explaining to him that Kwinn has sensitive skin so he needs to move around his body. Josh hasn’t really wanted to do much with Kwinn, other than feed him a carrot or 2, or 3. Kwinn will happily stand there and eat an entire bag of carrots if someone is willing to dispense them one after another! It’s really funny. He knows when the boys are there, he gets spoiled even more than usual. Kwinn has enjoyed quite a vacation given I was out of commission due to my foot. He didn’t much care for my foot being in the walking boot though. He would snort and stomp his feet when he saw the boot. Naturally I steered clear of his feet to avoid even more injury. He looks great though. 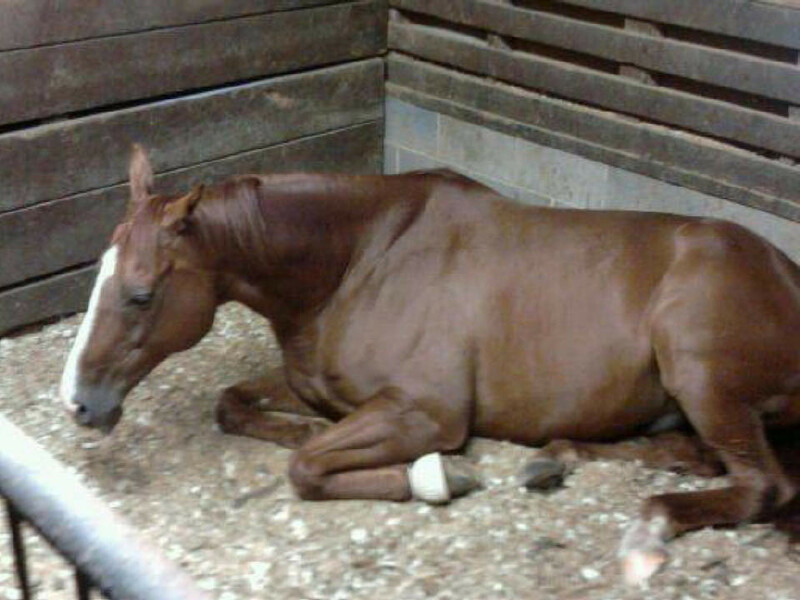 As you can see from the attahced pic, he enjoys his morning siesta after having breakfast. It’s his daily beauty rest. He really needs to get back to work now that I am able to ride again. The barn owner did ride him a few times. The first ride was quite fun as he decided to show his ballet moves. I’d love to take him out on a trail, but it requires getting on the dreaded trailer. We have tried everything to get him used to the trailer. Since he remembers everything that happens to him whether it is good or bad, we figure that for it to still be an issue for him, he must have had a bad experience at some point. The vet was here the other day for fall shots and she suggested giving him a little sedation to at least get him on the trailer. She had a horse that she used to have to sedate in order to transport him to shows. We may try that this weekend as it won’t be too hot here. I know once he has a chance to see what it’s like to be on a trail ride with his buddies, he will love it. Kwinn has been off-the-track now for 4 1/2 years! Can you believe that? Take care and I hope to see you all soon!